Italian painter. 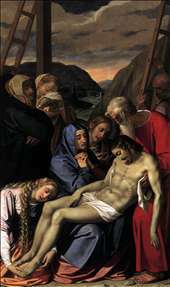 He is thought to have been a pupil of Jacopino del Conte in Rome. His talent was already evident in his early portraits, such as Cardinal Ricci (1569; Cambridge, Fogg Art Museum) and Cardinal Santorio (or Cardinal Granvella, 1576; London, Courtauld Institute Galleries). He was influenced by Italian court portraiture, particularly that of Raphael, and also by Flemish stylistic traits, which he must have absorbed through seeing the works (untraced) left in Rome by Antonis Mor. His brilliant palette was further enriched through contact with Venetian painting. The naturalism of the early portraits sets them apart from Mannerist portraiture; the careful rendering of details of physiognomy and dress was as important to Pulzone as expressing the personality of his sitter. 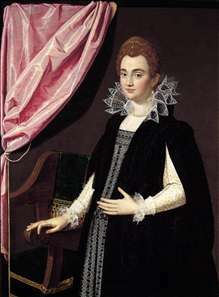 See more details about "Portrait of a Noblewoman"